I love mussels. I cook them at home and I order them out. When NYC started a slight mussel boom, I was excited. I have been to The MusselPot a few times and enjoyed it, so when Travel Zoo had a special I didn’t hesitate to buy it. The Georgia Peach bought it also, and we went the other night. I booked our reservation through OpenTable and noted that we had 2 Travel Zoo vouchers. I didn’t hear anything back from the restaurant, not even the usual phone confirmation. When we arrived, we were told in order to use the vouchers, I couldn’t get the OpenTable points. Fine. Then when we were seated, our waiter told us we couldn’t use 2 vouchers at one table, he spoke to the hostess. We were told it was the Mussel Pot’s policy of only 1 voucher per table. We asked about separate checks, that wasn’t an option. So to solve this problem, we were asked to move to two separate tables (which we pushed together), and got a new waiter (our drinks were already served). Problem solved. This wasn’t our first attempt to use the voucher either. In February Georgia Peach made a brunch reservation via OpenTable and called to ask if the voucher could be used at brunch. The voucher covers 2 soups or salads, 2 mussels, 2 sides…perfect for brunch. However, she was told they stopped serving brunch, although they hadn’t updated Open Table or their own website. Moving on. After the voucher debacle, dinner was just very ok. Gramercy Guy had the Cream of Broccoli Soup which he said was salty but not to the point where he didn’t stop eating it. 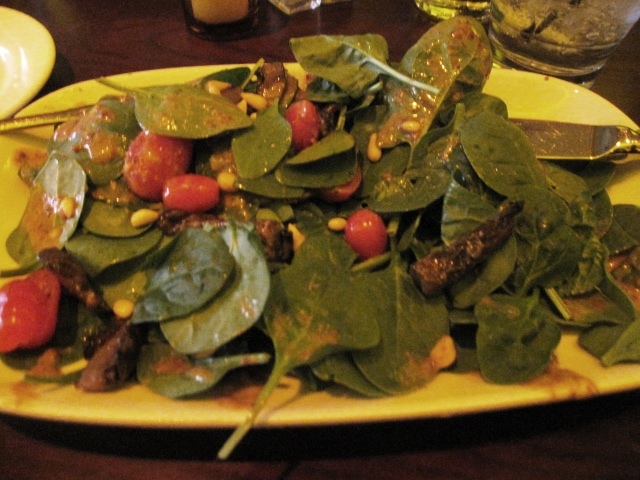 I had the Spinach Salad which was huge, but I wasn’t a fan of the dressing which seemed very gritty so I picked out the undressed spinach leaves and some pine nuts. For mussels, I went simple with the Provencal which was good, but I had many empty shells and no extra sinkers at the bottom of the pot. Gramercy Guy had the Louisiana which is like a gumbo with mussels. He thought it was good. Georgia Peach also had the Louisiana and Thyroid Storm had the Lobster Bisque, he found the Louisiana a bit too spicy for him. 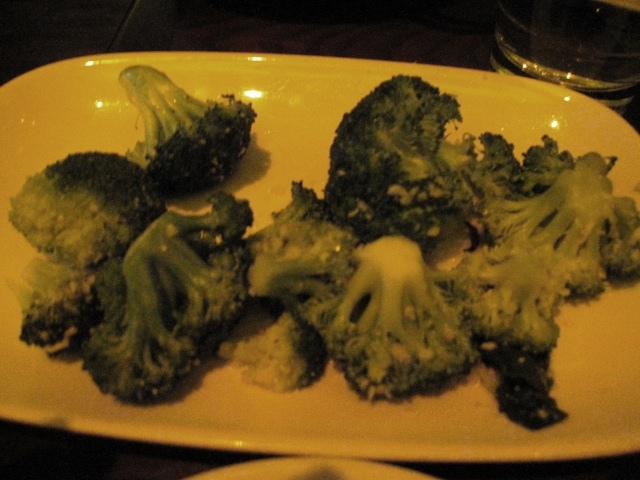 I got Broccoli for my side, which was good and garlicky and Gramercy Guy had fries. We opted to go to Cones for dessert. Bottom line, after this experience and just ok food, I will not be back. The hostess made us feel like she was doing us the favor by accommodating us and there are better mussels all over the city. There are two Flex Mussels which in my experience is far superior in service and food. The Mussel Pot should try Flex and work on emulating them.